The Leclanché cell consists of leakproof jacket (1) containing a porous pot (2) in which there is a paste of manganese dioxide and carbon granules (3) surrounding a carbon rod (4). The top can be sealed with pitch (5). A zinc rod (6) stands in a solution of ammonium chloride (7), and is connected to the carbon rod via a circuit and a light bulb (8). The zinc dissolves in the solution, setting up an electromotive force. The ammonium ions migrate to the carbon anode and form ammonia (which dissolves in the water), and hydrogen ions. 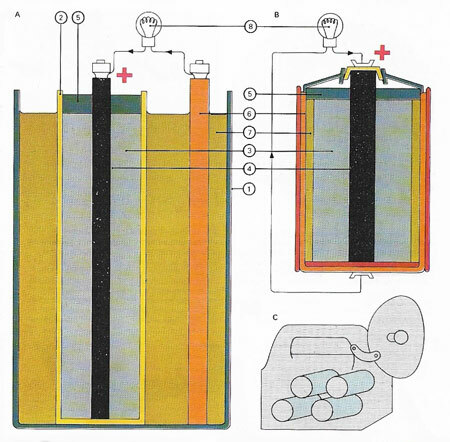 Flashlight dry batteries (B and C) have used wet paste cells of the Leclanché type. The Leclanché cell is a primary, electric cell invented (1867) by the French engineer Georges Leclanché (1839–82). Its anode was a zinc rod and its cathode a carbon plate surrounded by packed manganese dioxide. These electrodes were dipped into a solution of ammonium and zinc chlorides. It is the basis of the dry cell (see battery).